But the bar’s promotion is one exhibit in a disappointingly long parade of brands and businesses who think it’s wise to use “the news of the day” to promote themselves. Yesterday, I saw a few beer blogs I follow riff on Kavanaugh’s uh, fondness for the beverage. Given that the reason he was questioned about his drinking habits is because they may have been a factor in his alleged sexual assault of a woman, I just don’t see this as fodder for jokes on beer-Twitter. Call me sensitive, but I’d like to clarify that I am not offended by these jokes or promotions. Instead, I’m exhausted by them, and disappointed. The Kavanaugh news was everywhere yesterday, inescapable. That’s difficult for a lot of people, especially victims of sexual assault and trauma. To see that even restaurants, bars, or beer blogs need to riff on the news for self-promotional reasons adds to the crush of news, takes, memes, and jokes from which some of us really needed a small respite. When brands use serious political or social news to further their own image, they’re capitalizing on someone else’s discomfort or pain. 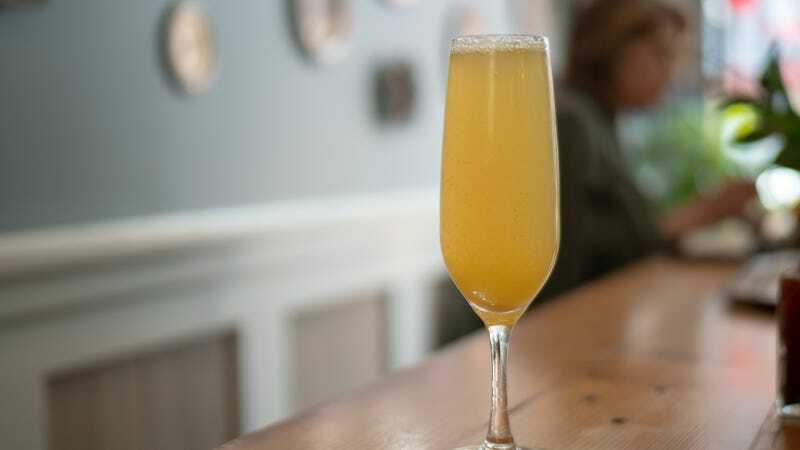 Why might someone find the Kavanaugh-mimosa deal funny? Because the hearings are difficult, ergo we need to drink, right? That’s a bottomless drinks promotion founded on the emotional anguish many feel while watching cable news breathlessly tear apart a sexual-assault case. It’s not a good look; it’s not especially funny, either. Just because a certain news story is everywhere on TV and social media doesn’t mean a restaurant or bar needs to address it—especially if it’s in a way that’s self-serving. Why not provide warm hospitality and a break from the crapstorm outside your business’ walls? That’s in direly short supply.